Learn here what kind of printers exist and what is the best printer for you, if you have any questions, just write a comment. Printers are work tools linked to the computer, these are a output hardware and its main function is to capture documents or images in a specific paper to each type of work, nowadays there are 3D printers. Depending on each user needs the type of printer will be different,there are printer to print from small pages normally use at home and offices to advertising hoardings among other sizes and types. Next we will try to give place and explain the functions these printers are made for. We will place it depending on the most frequent use you give it every day. This type of printer works expulsing ink through the heads located in the bottom side of the cartridges, some cartridges do not have integrated head since they use an internal injection system, however the injection is performed as in the ink cartridge. Those are the most traded printers nowadays because their low costs make it affordable when buying a printer for the first time. The average resolution of an inkjet printer is 600 dpi (dots per inches) in Spanish "puntos por pulgadas" is what defines the print quality. The printing process of these type of printers is based mainly on the printheads through tiny holes in the bottom side expulsing ink is where the printhead helped by two motors prints several as horizontal as vertical pixels lines, one motor moves the head or the cartridge and the other one moves the page. 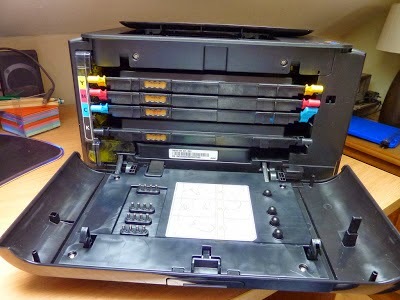 In some cases these printers use two cartridges, one cartridge for the three color yellow, cyan and magenta and another one for black ink. It was just until manufacturers like Epson have decided to produce individual cartridges for each color that there is a little money saving in costs when replacing just the cartridge that runs out of ink and not the entire cartridges with all colors as before. To these printers there is an continuous ink system adaptation that can be done to get to a long term money saving, something favoring these printers is their compact design making it easier to located them in any place of your house or office. These printers’ top distributors are Hewlett-Packard, Canon, Lexmark, Epson and Brother. These are a type of printers allowing you to print with better quality, they are of better functioning and performance and although their costs are high at the beginning, when comparing the cost per page, pages are more economic. Those printers are purchased to print color and black pages, black pages use just one toner cartridge while the color pages use four individual toner cartridges. The printing process consists of a photoconductor joined to a toner deposit and a laser which rotates while ionizing a drum that permeates the paper pages fixing it using pressure and heat. The biggest advantage of the laser printers over the inkjet printers despite the cost per page in a long term is the durability of the consumables, as it is known if a inkjet printer is not used for a long time its cartridges and heads get dried, while a laser printer can stay without use for even longer and the printer will not present any problem with its consumables. These printers’ top distributors are Hewlett-Packard, Canon, Lexmark, Epson y Brother. Those are the printers normally use to print bills or documents in a constant rate but with minimum quality needed, is a different type of printer from the described before since it uses a no so similar printing system as the previously seen. 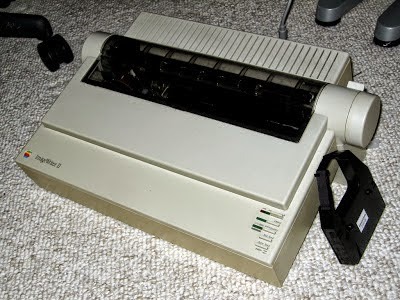 The most traded printer of this type is the Epson LX-300+, this printer uses a dot printing system that gives them their name (dot matrix printers), the dots are located in a head that moves from left to right printing by impact or hits over a tape just like a typewriter. With this printer although it seems difficult you can obtain graphics and different types of fonts thanks to its technology. These printers counts a line of rods or metal pins driven by an electro magnet that are also organized by a perforated path that prints a line of text at every printhead horizontal pass. With this printing technology you can find from calculator machines with (1 dot) to the (9 dots) which are the most used printers, actually the Epson LX-300+ uses (9 dots). The main disadvantage with these printers is the noise they produce when printing even after developing a shell to isolate it and the fact that you can print graphics and fonts with little quality. This type of printer uses a special paper called thermo sensitive which is written by a group of hot needles as the dot matrix printers, as soon as the needles touch the paper it gets a black color and leaves the image recorded. The cost per page and the consumables material of the printer is extremely economic since it does not use tapes or cartridges, although the initial investment is relatively high, the speed it means the unit of measurement identified to score this printer in this case is mm/s which indicates the amount of millimeters of paper coming out per second. A disadvantage of these printers is the lifetime due to the heat they generate the printing quality is getting lower while days come by. Sublimation printers are printers that transmit the image where you want to by using heat, they use an ink tape of four color cyan, magenta, yellow and black. They are printers to print in high quality, they are not recommended to print texts. These printers count with a tape that has the four colors disperse in it, those colors are applied one by one by using heat. hese sublimation printers are normally used to print promotional items as mugs and t-shirts. These are terminal transfer printers that use solid ink sticks, those sticks material are similar to the candles material. These printers melt the material that is fed by a printhead which transmits the image to a drum where the page passes by and the image is captured. The costs of acquisitions are similar to the costs with a laser printer so you can consider solid ink printers as an option to be used for micro-business. These printers disadvantages are the consumption of electricity, slow printing due to heating and that this type of ink when already on paper repels pens ink. Until today the only manufactures and sellers for these printers is Xerox. This name is given to printers use just to reproduce information, this kind of printers do not process and the impact part comes from the fact that it is needed to hit or impact the tape to be able to print, in this group of printers you can find. Daisy printer: its name is due to the fact that the printer has all its content it means the letters around a wheel looking like a daisy flower. Wheel printer: this name was given because its content is in a sphere that looks like a wheel. The plotter is a printer normally used to print advertising works, engineering and architecture, they are of a big size and they mostly have inkjet technology, there are even 157 cms plotters, with a plotter you can print any type of paper that is smaller than the plotter size and their cost is really high in relation to a printer to print documents. They are quiet printers and their main manufactures are Konica, Canon.